← Chocolate lava cake. Yep. What I Ate Thursday. On A Monday. I was never about good timing. I am a very punctual person, but when it comes to assignments or projects I procrastinate a lot. Hence, the title of this post. This is almost everything I ate last Thursday. This is probably the most ‘daily eats’ of a post you’ll see of me. It’s just way too difficult to live a normal life and blog every single spoonful that goes in my mouth! 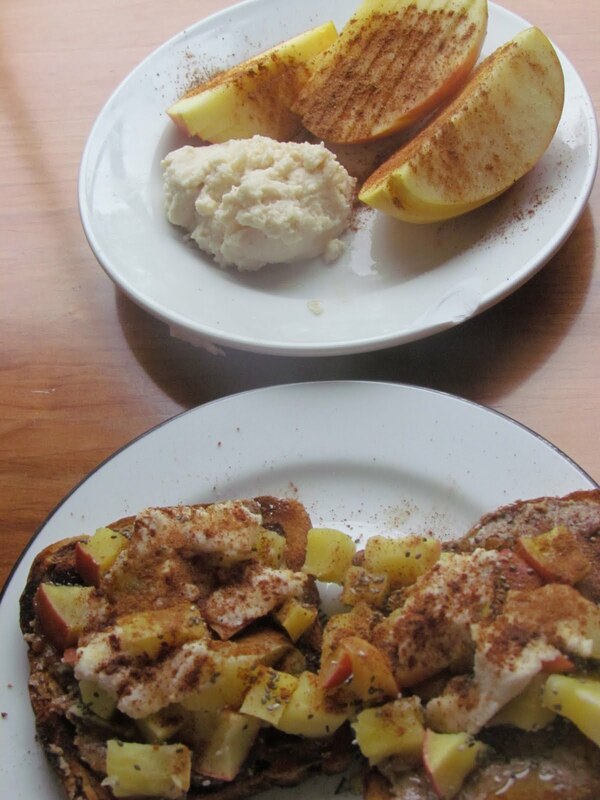 Breakfast was a giant sliced apple, half on top of two slices of cinnamon raisin toast with almond butter and ‘coconut creme’ (2 tbsps of Bob’s Red Mill Coconut Flour and 2 tbsps water and stevia to taste). The extra coconut creme was on the side for dippage. Lunch was a bit slapdash but so delicious! I believe this day I had 1/2 an orange mixed into a mix green salad with sunflower seeds, cranberries, chickpeas, 1/4 an avocado and a cranberry/orange dressing I bought from my grocery store, mixed with balsamic. 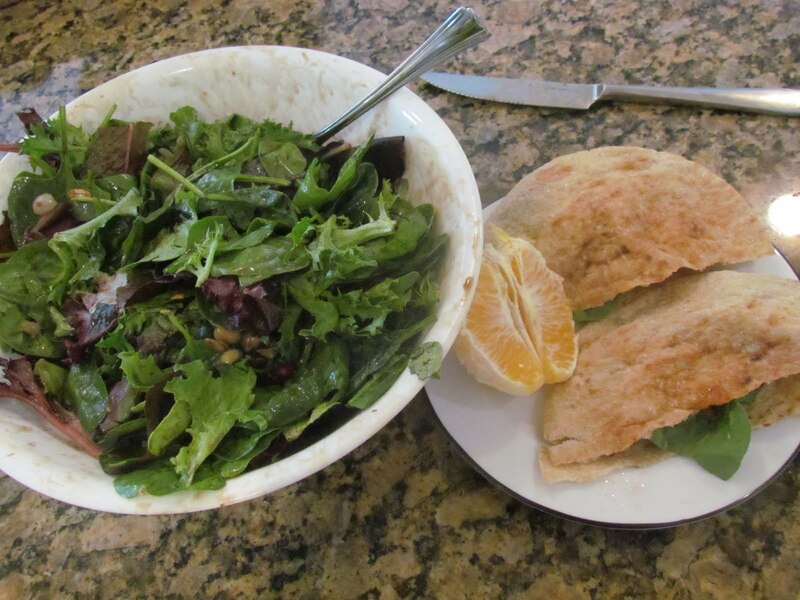 On the side I had a pita stuffed with vegan cheese, strawberry jam and spinach and the rest of the orange. Random but nourishing and filling. Unpictured snack was a bunch of dates and a Kashi bar before cardio/yoga. Dinner ended up being AWESOME. I had bought a tin of Starkist crab meat and mixed it together with 1/4 c egg whites, 1.5 tbsps of oat bran, seasonings and tomato paste and cooked it on the stove until crispy. Unfortunately I forgot to add the magic ingredient: SALT. Therefore, these were slightly bland. Still good though! I served them with parsnip fries and asparagus. This is pretty much my go-to dinner as of late. I love having a lot of different parts to my meals. And I’m entirely sick of soups and toast for dinner…now that my stomach is normal, I can’t even think about the gallons of soup I ate this winter! I think my hands are still orange from all the butternut squash! And right now I’m chowing down on this. 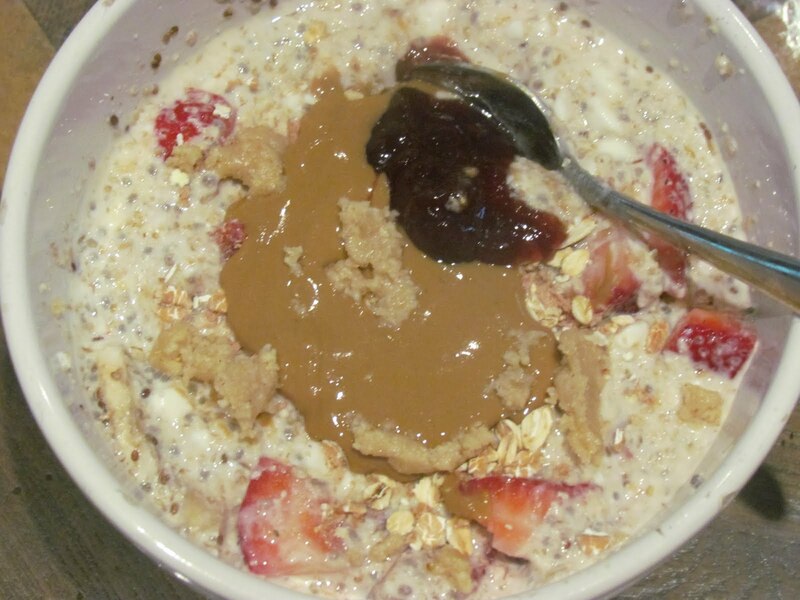 Strawberry Cheesecake Overnight Oats. Not as good as a Cheesequake from DQ, but still awesome. Cover with plastic wrap and chill overnight. This morning I topped it with a spoonful of Swiss Muesli, sunflower seed butter from Trader Joe’s (BEST NUT BUTTER EVER), a little crumble of some homemade cashew butter (taken directly from The Wannabe Chef). It tastes EXACTLY like a sugar cookie. Dangerous. Off to finish my coffee and run some errands! Happy Monday! Yoga tonight, cannot wait! 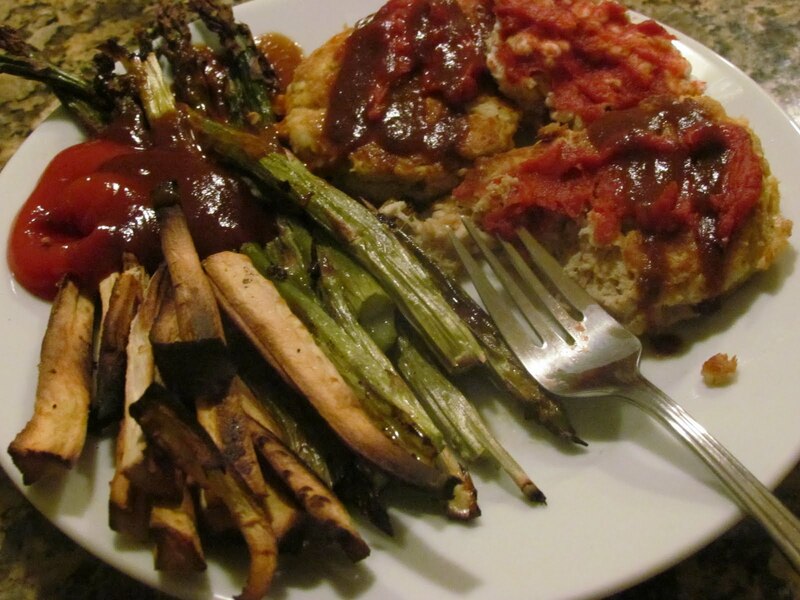 Your meals are always so beautiful! jeez these all look so tasty. I just bought some tuna today and I can't wait to dig in!! That's a good idea about the coconut cream. Does it work like that with all flours?